Adhesif Clothing - I Remember!!!! Other photos unless otherwise noted are courtesy of Adhesif. I have to admit - I've been a slug all summer and haven't been posting much. This blog was supposed to go up a long time ago. BUT it turns out the timing is perfect after all as Adhesif and Forsya Boutique are having an amazing sidewalk sale on Sunday, August 26th. For information on this sale click here. The universe is in charge and doing well. I had the privilege of meeting Melissa Ferreira about 7 years ago when my daughter was doing some freelance modeling. This designer became one of my first interviews when I stepped into writing a year later. Looking back, there have been many personal wow moments and I have searched high and low to find photos of just a few of my favourites from previous seasons. The first design I fell totally in love several years ago was angora knit capris. They were part of a sweater/capri set created from vintage sweaters. I adored them and had them photographed for submission to Gestalt Magazine in NYC in 2006. Now it becomes a little more confusing as to the actual timeline, but here are a few more I distinctly remember. 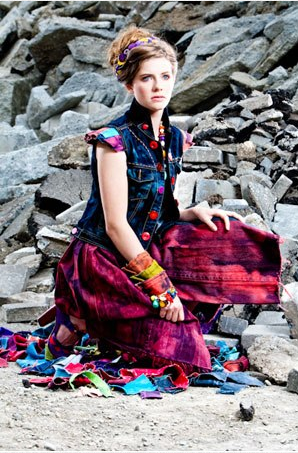 There was a collection of re-worked, dispersion-dyed denim called Rags to Riches that were phenomenal. 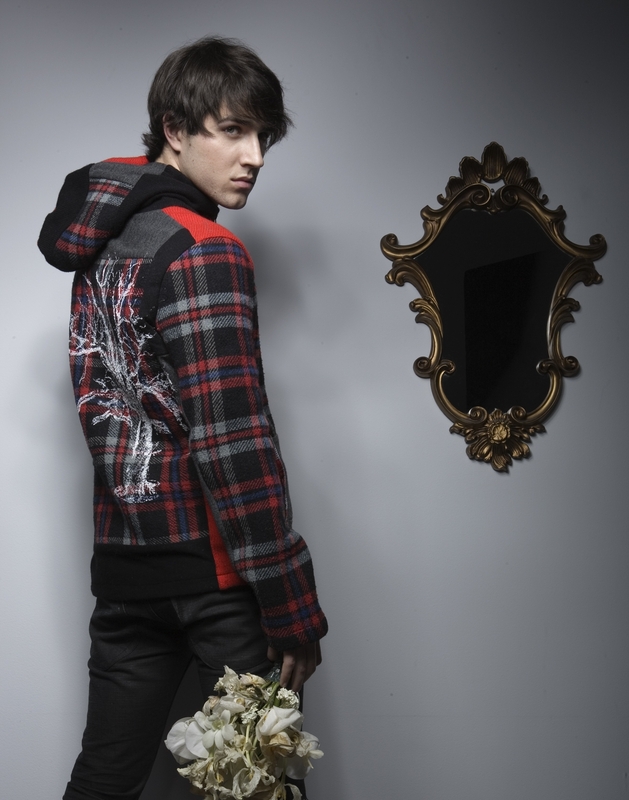 Then there was a mens jacket with an original, large silk-screened wintery white tree on the back. Another collection she offered hand-made pill box hats to complete your Adhesif ensemble and then honestly, who doesn't crave a pair of her fingerless mittens or one of those amazing coats. Over the seasons, each collection is anchored by a strong selection of dresses. separates and coats that vary from year to year - feminine, retro, funky, down to earth - that draw a continually larger client base to the label. What I love about this designer is her range. From soft and feminine vintage looks to wild and colourful funky wear, Ferreira's touch can be seen in each and every design. In fact she is involved in every step along the way from flipping through 1,000 pound bales of garments to find the materials needed each season, to designing, cutting, sewing, finishing, sales, merchandising and cashier. All garments are created from reclaimed materials which insures that no two seasons, in fact no two garments, are exactly alike. Each has it's own unique charm. 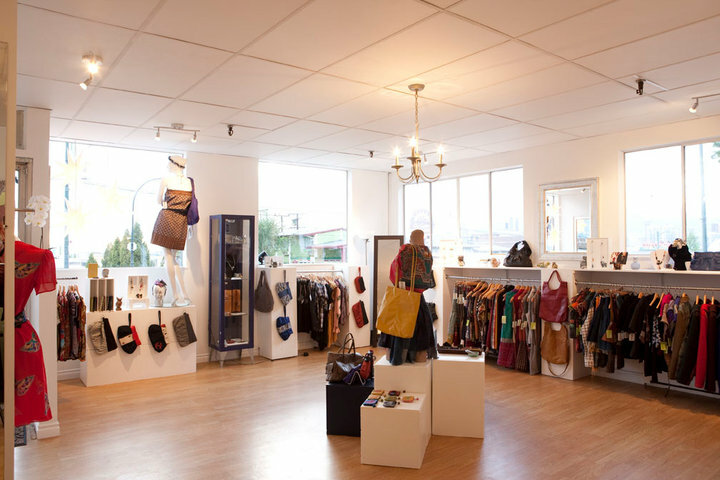 In 2010, Ferreira decided it was time to open a flagship store at 2202 Main Street. She shares, "I have always been very passionate about promoting eco-consiousness. When deciding to open the shop, I wanted to showcase not only Adhesif's vintage re-worked designs, but also feature the works of some 30+ other very talented local artisans and designers who are following the same mantra - everything from beautiful handmade jewellery to a few other clothing lines. The store also offers on-site tailoring and alterations so instead of discarding what you have we'll fix it for you. That's smart consumption!" As each item is unique and deserves to the featured, the store is set up like an art gallery. It's the kind of shop a customer can pop in on a regular basis and enjoy the experience of finding new items of interest each time. Adhesif is a home grown indie label, so being a part of local events is important for the brand. 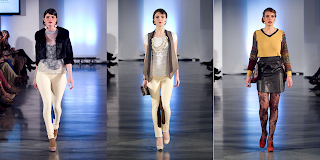 Ferreira has shown her collections at Eco Fashion Week for the last three seasons. "It is always great fun and provides the brand with excellent visibility in terms of both media and public attention." The brand has also been a regular at Circle Craft's traditional Christmas Market for the last seven years. Ferreira takes on another role as the organizer for the successful "Nifty For Fifty" sale that happens every April. It features 30 local designers selling handmade wares for $50 and under. A great chance to support local designers at a price everyone can afford! For Fall/Winter 2012, you'll see polished, but cozy layering inspired by real women the designer spotted on the streets during travels in Germany and France. Titled "Big City Lights," the collection showcases a luxurious mix of fabrics such as reclaimed lambswool, cashmere, jersey knit, silk, cotton and denim in an colourful combination of mustard, amber, blue, red and chocolate. This season Ferreira is particularly proud of her outerwear offering. 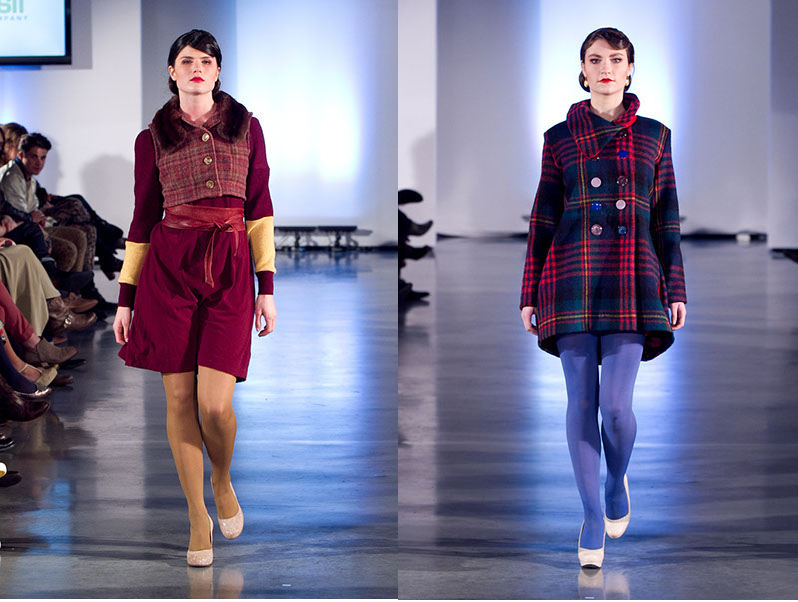 "In Europe there were lots of cute, 1960's three-quarter length box cut coats which inspired the Boxcar Coat. It has become my favourite piece in the entire collection." This colourful jacket is created from vintage Melton wool blankets and sports an asymmetrical collar, elbow patches and a reversible applique. The perfect accessory? Adhesif's fingerless mittens which are a best seller year after year. Ferreira always has many ideas of where to take her eco-collection - both local and global - but the focus for now is to continue to build her brand and express her creativity. Her sound advice to those just starting out is, "Be prepared to make a lot of sacrifices. You'll need to work your little behind constantly, so you better be passionate about what you're doing. Get your work/yourself out there! The rest will fall into place." Be sure and stop by the Adhesif Boutique at 2202 Main Street. to see the latest in offerings and don't forget the sale this weekend. Other locations are listed on the website at www.adhesifclothing.com. For media inquiries, please contact Nicole Stewart PR.